Standardized testing has never been an objective, fair evaluation of intelligence or learning. From its beginnings it has worked to recreate and reinforce current systems of oppression rather than to liberate communities from these oppressive systems. Standardized testing originated with the eugenics movement which searched for “scientific” evidence to show racial differences in intelligence (Kendi 2016). The fist standardized tests were created by placing white perceptions of intelligence above all others. 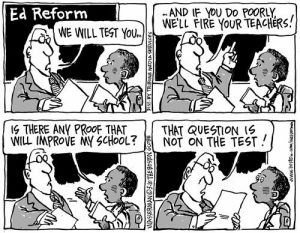 These tests were and are a better test for whiteness and privilege than they are for learning or intelligence. The achievement gap intentionally constructed by these standardized tests continues on today in the high-stakes standardized tests that are used to make most of the important decisions about our public schools today. This achievement gap functions under a framework where there is one scale of intelligence or one type of intelligence–what would it look like if we valued “intellectual difference” and diversity and saw more than one type of learning as important and valid (Kendi 2016). As long as our public schools revolve around high-stakes standardized testing, we cannot teach children with a pedagogy that values intellectual difference. High-stakes testing impacts schools across the country. In my research about organizing around high-stakes testing, I found a lot of activity in Chicago and was interested in learning more about how groups were approaching the issue. In recent year, the city has seen an increase in the number of students and there families choosing to opt out of nationally mandated standardized tests (Perez et al 2015). Many of the organizations working around standardized testing in Chicago provide parents with information about their rights to opt out of these tests and encourage them to make an educated decisions with their children.